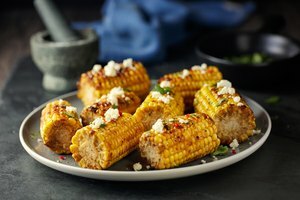 Cook delicious corn on the cob easily and add a hands-on playful vegetable side dish to your next meal using your electric roaster. Bring out the best in your corn by cooking and seasoning it without removing a single kernel. Set your electric roaster to 350 degrees or medium-high to high heat setting if temperature is not specified on your model. Read the manual for any special instructions on setting the heat or a built-in timer for a 40 minute roast. 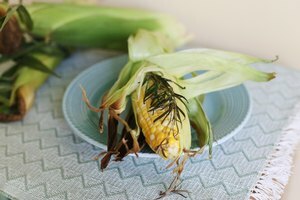 Prepare each of your four ears of corn by removing any dried or brown leaves on the outside of the husk and using kitchen shears to trim off any discolored or protruding corn silk. These extremities will burn before the corn is cooked if they are not removed. Place your trimmed ears into a large bowl and cover them completely with cold clean water, allowing them to soak for at least 30 minutes fully submerged. This will give the corn enough moisture in the husk to steam cook in your electric roaster. Remove your corn from the water and pat the outside of the husks dry with paper towels before wrapping them individually in aluminum foil. 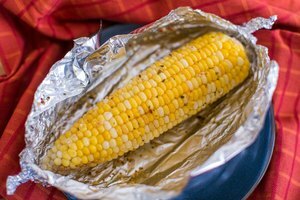 Firmly press the aluminum foil on the the corn and make a seal at the top and bottom to trap in the moisture during cooking. Lay your foil-wrapped corn into the preheated electric roaster and cover with the lid for at least 40 minutes. Check your corn by carefully peeling back the hot foil and husk to press on a kernel with your finger. If the kernel feels soft and yields easily to pressure, your corn is fully cooked. 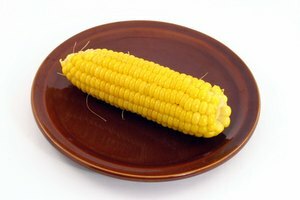 Open all four fully cooked ears of corn and season them to taste by melting butter over them and adding a sprinkling of salt and pepper. Serve while they are still hot with paper towels or corn cob holders. Other spice choices could be added to to the salt, pepper and butter base to compliment the other seasonings of the meal.